I am offering regular 1 day/weekend massage workshops. 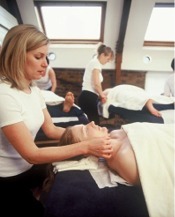 These courses will teach you to give a safe body massage.We will concentrate on head/neck and back & shoulder area. It will cover basic anatomical understanding and contra-indications. It will be fun and instructive and is ideal to attend with a friend.